Post Digital, and what to do with a graphic designer? The digital revolution is over. Digital communication technology is fully integrated in our lives. But with so much disinterest for digital technologies at the Dutch art colleges, can the future Dutch designer still manage to create useful contributions in the world that is now data, code and social media multi-nationals? In this lecture, I can perhaps add a few things to the discussion around analogue and digital and visual communication designers. To do this, I will first go back to the essence of communication, and then, via print, via the digital, I will discuss the notion of Post Digital. What is it? Is it hype or perhaps a useful handle to think about a truce between the analogue and the digital? Is this the next phase of our communication culture and is this then, perhaps a new opportunity for visual designers to get on board? So now everybody is an author, a photographer, a designer and illustrator. Within a matter of minutes you can create a half decent website, buy a ticket through some concert app- and locate yourself amongst the crowd with your GPS. Through Instagram, you keep everyone posted on the moves of the lead singer, and through SnapChat you send those drunken images, that somehow do find their way to your friends Facebook pages all over the world. The utopia of total communication, free, immediate and without interference of others has become a reality of the pragmatic everyday. To just reinforce the enormity of the digital prowess, please check out this listicle with 10 shocking Internet facts. 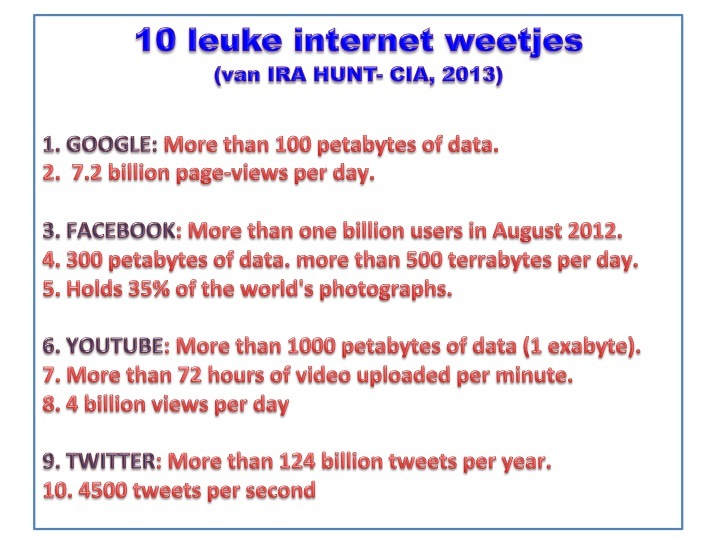 But what I do find far more shocking are the results of a research done by Aldje van Meer, researcher en coordinator at CrossLab, at the Willem de Kooning Academy– October 2012. The research was held amongst nearly four hundred students at nine Dutch Art colleges (not including the Hogeschool voor de Kunsten- Utrecht, where this lecture was held). This research revealed that though all students well versed in social media and the internet as a whole, there were barely any students that were actually creating or conceptualising something interactive, a website an app. The amount of assignments that should have stimulated some kind of interactive encounter was just about one out off the entire offer of assignments during the academic course. For graphic design students it was slightly better, namely nearly two assignments on the whole. But again most of them never created or conceptualized a web application. Most students rather created a poster than a website. In other words that fundamental and much needed practical research into digital communication structures does not exist. The urge to creatively explore, to make with the digital building blocks, the revelations coming from digital principles and their far-reaching consequences- seems very much absent. There are is no future practices developed within design courses responding to present dominant communication system, no own voice is developed, no position taken, no innovative experiments. These digital natives seem more like digital naives. Don’t they need designers and image-makers at the front-end of communication technology? But if they are no longer needed, than what is a visual communication department for? Despite the fact that I’ve been saying that we are all so very digital, the way we communicate is still very much following the essential structure of written or printed, communication. There are off course already the visible digital traits of digitisation, such as hypertext, interaction, multimedia, real-time, streaming and so on. Also we already experience changes in grammar, style and lingo; Shorter texts, descriptive headlines, or Twitter, Facebook and other media platforms as media sources. But still when you read the text on websites or blogs, it is following the order of the printed word. This is off course not that strange considering we are coming from infrastructures and networks that have in place for hundreds of years. The way we perceive information is still most often through reading, and this we have been taught in school as the way to gather information, to acquire knowledge and correspond with teachers and each other. It’s the way we see stories, sentences, words and letters. Any change here towards new media is a slow process. It requires new insights, new applications, new ways of thinking and gradually practical actions and internalisation. Writing and printing forces us to select, from all the information we wish to communicate, only that what actually can be written in words. Sounds, cries, smells, movement, innuendo and the visual world can be described, but can never be fully verbalised. Further what we write needs to fit in the material object, the style and format, a more or less linear story, rhythmic pages and a limited amount of space, where content and concept- design are developed long before the moment it is presented to its reader. It means through ink, screens and lines, that letters and images are fixed on paper in limited colours. It means separate symbols that in each other’s presence and in a certain order create meaning. This physical information-object comes with an infrastructure of writers, editors, designers, printers, it is distributed through publishers, distributors, kiosks, bookstores and satchels and is read in libraries, reading cafés, with reading tables, reading lamps and reading glasses, it is read in bed, in a bath or at the breakfast table. Print culture beyond the distribution of information, represents economic, juridical, historical and emotional values. But do not forget that once upon a time, print was also new media. Perhaps best illustrated with this clip. Original taken from the show “Øystein og jeg” on Norwegian Broadcasting. (NRK)in 2001. Formally the digital structure is that of mathematics, of digits, automation and electronic networks within which there is the possibility of endless variations (Manovich, 2000). This abstract world is inside an electronic calculator with a connected input-machine that translates analogue signals into digits, and through algorithms, these digits get recalculated into outcomes that in turn get translated through a connected output-machine. These can be turned into sound, text, image or commands to start a car or trigger a ringtone. In short we have developed a culture in which media are not just a component of how we communicate, but also what we communicate and therefor it also determines our thinking. The Media is the Message (McLuhan 1964), and importantly so it is the essence of what we express. What media cannot transmit, we will not be able to convey. When I was young, I was taught at art-college, that the task of the visual designer was to use visual means and reproduction technologies to make a message insightful, recognisable and engaging. I was taught to interfere to enhance, through applying form and image. By being a partner in the realisation of the message us designers could play a major part in the persuasion of the potential receiver to look, to read, to understand and to absorb. The designer conceptualized and created ways to use media as effectively as possible, whether it was towards a copied fanzine, a timetable or a poster. But isn’t this still the essence of visual communication? And is this not still the principle within the digital realm? Do we not have an obligation to guarantee, to the best of our abilities, the sovereignty of each message we are asked to meddle with? The computer with all its computing power is not only a tool, something you can use like a hammer or photocopier, it is a medium- a translator of signals, and agent, a creator of content. And we are witnessing a slow shift whereby the computer- the calculating machine- is disappearing from view. It is getting smaller and smaller, incorporated in other machines and hiding in closed communication objects like smartphones and tablets. The document within this computer is as Lev Manovich calls it a piece of software performance (Manovich, 2008) It is not simply piece of text, it’s a mixture of text and software instructions. The software continually changes and in these changes the way we read but also the content and thus the meaning off what we read changes too. And the software, the motor of all digital acts is equally getting more and more inaccessible. And lastly our social cultural expressions which we exchange through infrastructures, enabled by the enormous media multinationals, Google, Amazon, Microsoft, Apple and Facebook, so called The Stacks: (Sterling 2012). Through their ownership and supply their formats, platforms and networks influence what we say and how we say it, but as profit-based companies they do not always keep the same agenda as the users. The job left to a visual designer, if he or she has no understanding of hardware, software and stacks, is reduced to that of choosing the colours for a colour-by-number colouring plate. And choosing the colours, the users do themselves. Is it that strange that design students turn against this universal and formatted world and stick to making posters? Perhaps not, but actually I really think that this is very strange! This brings me to the term Post Digital. In a post-digital communication world, the digital platform is no longer the aim, but a stopover to another physical moment or object in the real world. As a term it has been used since 2009 and has been more commonly associated with the countermovement against the techno-dream of an ever faster abstract digital world. It points to the need and acknowledgment of a physical world, the importance of Do-It-Yourself and understandable analogue machines. It points to a sense of personal control and free will. Equally it is a movement into the computer, data and networks, its hacking data and code in order to examine and expose the knowledge within. This does not mean that Post Digital is against the computer, software or against social media. On the contrary, post-digital communication is all about the connection of digital and analogue structures, platforms, experiences and moments to bring them together onto one level- that of serving our communication needs. I propose to use the term not to point to a style or period in time- but to point to an attitude. Max Kisman when designing his magazine Vinyl in the early eighties, was post-digital before we knew we were digital. Niels Schrader and Gilles de Brock are very Post Digital designers indeed, though they might not like to agree that they are. My proposition is to use Post Digital as a pointer to the near self-evident presence of a digital-analogue relationship and the ability for this to be expressed in as many ways as there are (visual) media. The main benefit of using the term is, for now, that it can take us out of the existing dichotomy, and existing digital technology block and allow designers to enter into the already existing discussions, for instance the discussion that has just been this February at the online forum Empyre. But to give some concrete examples, perhaps think of print-on-demand systems. Books can now be printed in minimal editions: editions of one, without the huge preprint costs that come with traditional offset printing. Books can be printed from uploaded files at specialised websites where there is a range of template available. At the same time costumers can browse and buy from the same website. 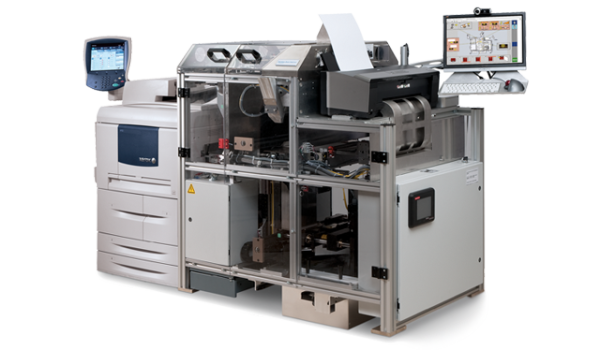 The printing machine can then print and bind the book and the book object can be send or handed over. The Espresso-book machine can print you a bespoke book while you have your cup of espresso in the store. But where the format adds convenience and reduces costs, it could do with some designers to up the quality of typography and layouts. Another example is data journalism and data visualisation with a critical stance. The journalist and visualizer dig into the data that is now so freely available and use software to generate, extrapolate and distil meaning and information. In cases like WikiLeaks and the NSA Affaire, revelations were done through the traditional print-press networks. Using their expertise, their status, and their longform reading- called newspaper, which guaranteed a better impact and exposure where it mattered. 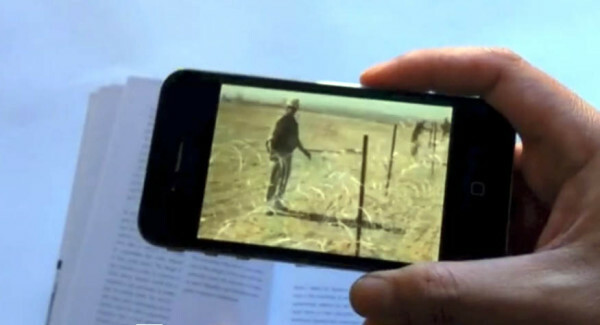 Take augmented reality, where a book provides the stable, fixed platform, but tags, printed symbols, inside the book. Point the camera of a smartphone or tablet at these tags and they trigger a website that can show extra information, moving images or updatable content. Or take this last example: Florian Cramer, used this image in his article What is Post-Digital? (2013) in which he explores the notion of Post Digital in great detail. He uses this image as an example. A young man is in the park typing poems, which he sells on the spot. 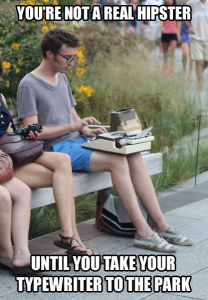 Why is he using a typewriter? Maybe he is using this old medium, to get notices by his audience, because he does not need electricity, because the typewriter is writing and printing in one. Because typewriting is cheap, portable, instant and direct with added visual impact. Does he reject the digital world? Or does he use old and new media on equal terms to get his message out? Is Post Digital hype or a name for a next phase in communication? Whatever it is, it acknowledges our existence in the physical world, it questions our historical bond with the printed word and the one-way system of print publishing whilst it also sees the enormity and potential of digital technologies. To design in this world, you need not only to acknowledge the materiality and technologies of both printed and digital structures, you need to understand it, get to the bottom of it and work with it. Do you need to be able to program, create information architectures or interactive structures? Just like typography and drawing, at least trying to program is a good start. 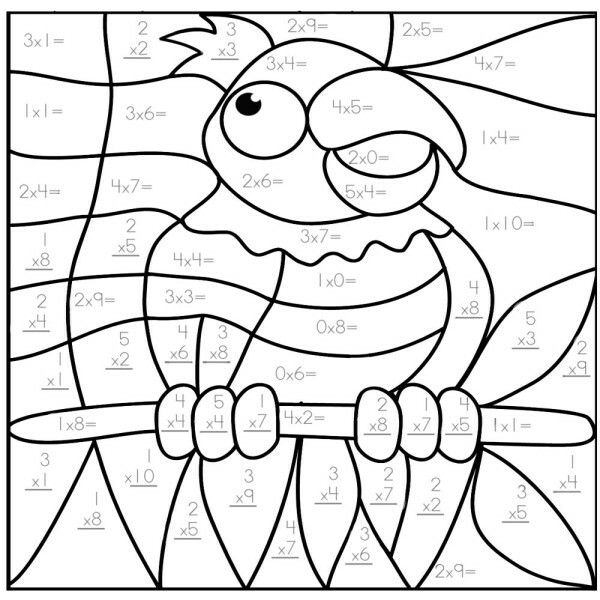 This entry was posted on Tuesday, March 11th, 2014 at 12:55 pm.